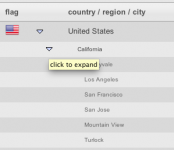 Located in Location data >> countries / cities, this report lists all locations from which people visit your site. The columns in the table are; No., flag, country/city/region, (country) code, visitors and percentage. The percentage indicates the total percentage which each row/entry represents in its respective category (as opposed to the entire report). 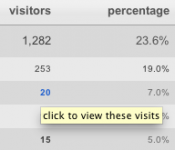 A report which displays all visitors to your site on the basis of location. The top level is country, from there it is possible to drill down to local level, through state or province to city, town or village. Visually, the report contains a pie chart and index, listing all locations. The information is also displayed in a table format than can be expanded per entry. Visitors-per-country Click on any number in the ‘visitors’ column in order to be taken to found visitors for that country. In other words; a filter of traffic clickstreams per country. Country fact sheet Click on any country name to be taken to a fact-sheet regarding that country. Options bar Click on the wrench icon to open the Options bar. The Options bar includes: site selection, make PDF, download, print, and refresh.